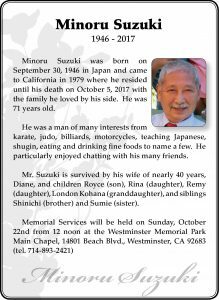 Minoru Suzuki was born on September 30, 1946 in Japan and came to California in 1979 where he resided until his death on October 5, 2017 with the family he loved by his side. He was 71 years old. He was a man of many interests from karate, judo, billiards, motorcycles, teaching Japanese, shugin, eating and drinking fine foods to name a few. He particularly enjoyed chatting with his many friends. 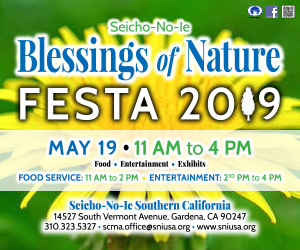 Mr. Suzuki is survived by his wife of nearly 40 years, Diane, and children Royce (son), Rina (daughter), Remy (daughter), London Kohana (granddaughter), and siblings Shinichi (brother) and Sumie (sister).